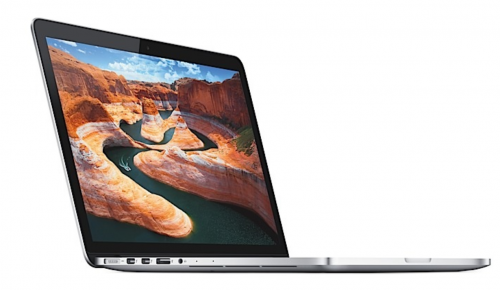 If you’ve been waiting for 13 inch Macbook pro with retina display, your wait is over. Apple has launched the new 13 inch Macbook pro ultra portable notebook with stunning retina display weighing 3.57 pounds and is 0.75 inch thick. The base model contains 128 GB flash storage, 2.5 GHz dual-core intel core i5 processor(with turbo boost upto 3.1 GHz – and intel HD 4000), 8GB of RAM is priced at hefty $1,699 (US) (price in India to be about Rs. 114,900 – Contact Apple authorized resellers). Add $300 extra if you want the same specs but with increased storage i.e. 256GB flash storage. The new 13 inch Macbook Pro with retina display can be configured with upgraded processor of upto 2.9GHz dual core intel i7 processor, storage capacity increased upto 768GB flash storage. It has been released and can be configured online on apple website or bought directly from retail stores or resellers point. Since, it has retina display, the effective resolution is 2560*1600 pixels with density of 227 ppi (15-inch Macbook pro with retina display has resolution of 2880*1800), viewing angle of 178 degree. The display is of course top-notch for 13-inch notebook as such resolution is not found on any other notebook of this range. Retina display promises higher contrast, less reflection, sharper image quality, vibrant pictures. The text would appear as fine as we see on printed pages. Presence of flash storage makes booting, applications launch, waking from sleep, overall performance – a breeze. But, we know how costly flash storage are. This makes significant increase in price of Macbook pro here if you want more storage capacity. As noted above, for just 128 GB extra than the base model, you need to pay $300 extra on the price of base model of 13 inch macbook pro with retina display (I wonder why Apple didn’t devise any easy to use model number so that we could easily refer to this new notebook instead of calling it the way we’ve been calling throughout this article). Since, it is powered by intel processors so expect faster speed and performance without doubt, but not as fast as 15-inch Macbook pro because 13 inch Macbook pro contains intel 3rd generation processors with dual core whereas 15-inchers contain intel 3rd gen processors with quad core. The memory i.e. RAM can not be further upgraded i.e. you’re limited to 8GB, but the good thing about RAM is that it is of 1600 MHz which is really fast. FaceTime HD camera, inbuilt dual microphones, improved speakers for better audio output are there. Three-stream 802.11n Wi-Fi, faster Bluetooth 4.0, and a MagSafe 2 power port in addition to the new HDMI port, sdxc card slot, two USB 3.0 and 2 thunderbolt ports give you various connectivity options and choices. Running on OS X Mountain Lion, the new 13-inch Macbook Pro with Retina display delivers upto 7 hours of battery backup as claimed by Apple. Since, 13-inch model is preferred by power user who don’t want to compromise with portability or performance, battery life should be well right upto hours claimed. 3rd generation intel processor (dual core). Presence of USB 3 ports, HDMI. No dedicated graphics card – Absence of a dedicated graphics card is a major issue here. Retina display with intel HD 4000 graphics doesn’t seem very promising because if people wants higher resolution, they do want higher graphics capability from their system. High price – Is the price justified. Are you willing to pay that much just for higher resolution display? Listed above are major differences among the three models of Macbook Pro. Given price is starting price, not the price of the highest possible configuration/specifications as listed in the table. If you’re business user and often work with graphics-related computing, you should opt for 15-inch Macbook pro, but if you want portable entertainment device (not gaming), you can opt for the new 13-inch model. So, what do you think? Are you going to buy it or do you consider it overpriced?